The first 737-100 was first launched by Lufthansa in the year 1965. and entered service 3 yeras after . The 737-100 is the smallest model of the 737. The 737 was considered as a short range small capacity airliner among the Boeing jet airliner family below the 727, 720 and 707 and was originally conceptualized as a 60 to 85 seater. 737-700ER, 737-800, and the 737-900ER. 737-100 - Typical single class seating for 100. 737-200 - Typical single class seating for 115, max seating for 130 at 74cm (29in) pitch. 737-200C/QC payload 15,545kg (34,270lb), consisting of pallets or containers. 737-100 - Wing span 28.35m (93ft 0in), length 28.67m (94ft 0in), height 11.29m (37ft 0in). Wing area 91.1m2 (980sq ft). 737-200 - Same except for length 30.53m (100ft 2in). 737-100 - Empty 25,878kg (57,000lb), max takeoff 49,940kg (110,000lb). 737-200 - Operating empty 27,448kg (60,600lb), max takeoff 52,390kg (115,500lb), or optionally 58,740kg (129,500lb). 737-100 - Max speed 943km/h (509kt), economical cruising speed 852km/h (460kt). Range with max fuel 2855km (1540nm). 737-200 - Max speed 943km/h (509kt), max cruising speed 927km/h (500kt), economical cruising speed 796km/h (430kt). Range with 115 passengers and reserves between 3520km (1900nm) and 4260km (2300nm) depending on weight options and engines. 737-100 - Two 62.3kN (14,000lb) Pratt & Whitney JT8D-7 turbofans. 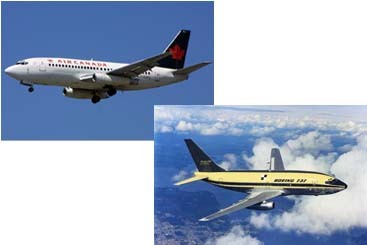 737-200 - Two 64.5kN (14,500lb) JT8D-9As, or two 68.9kN (15,500lb) JT8D-15s, or two 71.2kN (16,000lb) JT8D-17s, or two 77.4kN (17,400lb) JT8D-17Rs with automatic reverse thrust.